Lies an Emerald Isle called Inisfree. Is the very last bastion of the old, ancient gods. The gods gave the warlords a wondrous beast. That the revellers silenced and uttered no sound. The Gift from the Gods, more precious than gold. Then Jack-o'-the-Green came and blew on his horn. Trotted out to the hound - and you know what is more? Gave homage to his glory by kissing his paw. You say "'Tis not true", don't believe what I say? 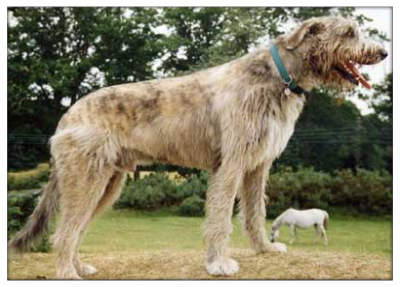 Yet the great Irish wolfhounds are still here today! When the tiny white horse came and did it again!